Whilst cruising through the archives of the family De Moor, I stumbled on a drawing which appeared to be a never published before front cover for a new french version of “Oorlog In Het Heelal”. “Oorlog In Het Heelal” was originally created by Bob De Moor for the weekly magazine Ons Volk in 1949. It got 2 later publications, but only in magazines and never as a standalone album. 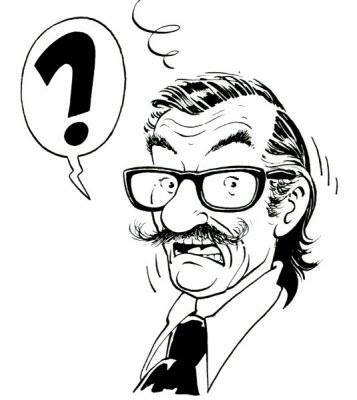 Both the dutch written Ciso and the french written Comics 130 magazines would publish the story some 20 years later: Ciso in issue 5/6 (1971) and Comics 130 in issue 9 (1974). 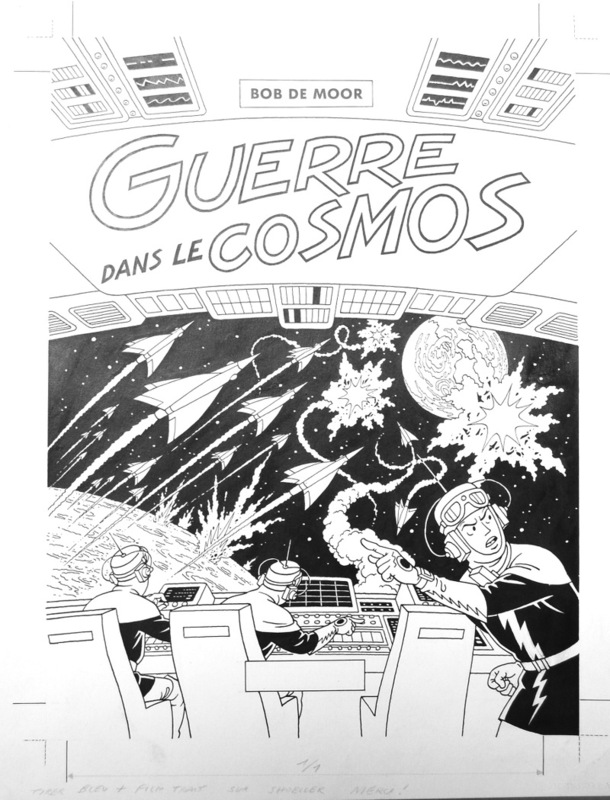 The never published before cover artwork of the unreleased re-edition of “Guerre Dans Le Cosmos”. 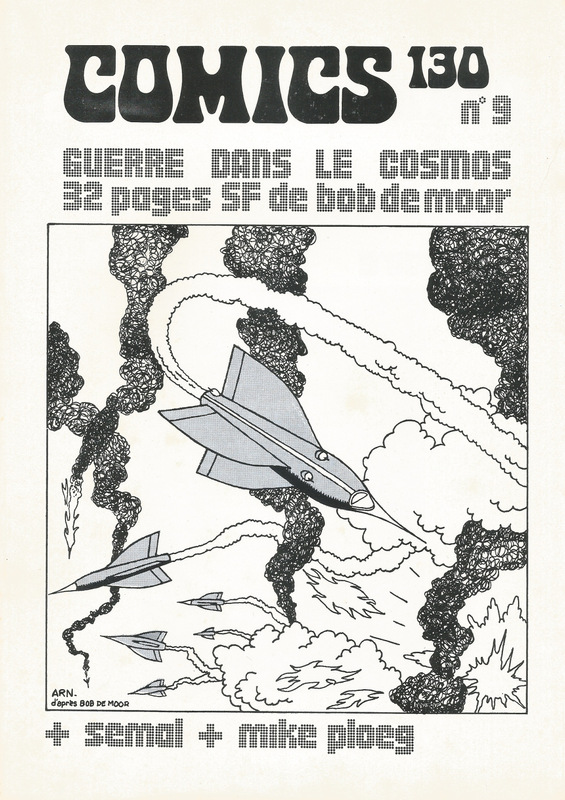 The first publication in Ciso issue 5/6 (1971) included 10 pages on Science Fiction in Flemish and Dutch comics by Danny De Laet, the story “Pilot Storm” by J.J. Nieuwstraten preceded by a short introduction (33 pages), an introduction on Bob De Moor (3 pages), an 1974 artwork by Bob De Moor for the album and “Oorlog In Het Heelal” (32 pages). A last page includes a rather good oversight on De Moor’s bibliography until then. The back of the magazine features a cartoon by Bob De Moor which has basically no link with anything featured in the magazine itself. An extra let’s say. 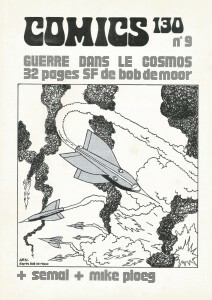 The second publication was in French in Comics 130 magazine in 1974 included the 32 page counting “Guerre Dans Le Cosmos”, alas with a cover which was not by De Moor (although it is being sold as such on eBay and related sites), a special on Bob De Moor (4 pages), “L’ambassadeur” by Semjoa (8 pages), the price Saint-Michel 1974 (2 pages) and a mini-special on Mike Ploog. Prices for both items are between 29 to 70 Euro depending on the quality. If you haven’t yet added them to your collection now is the time to act, because it has come to our attention that items featured on the Bob De Moor site tend to be searched for a lot once it has hit our pages. Consider that to be a nice side-effect :). Note that the print quality in both magazines was far from being splendid, but that should probably be attributed to the material that had to be worked with – which looks like cleaned up copies from old magazines. The drawing we show you today however shows that there were plans to reedit this story somewhere in the late 80s (1987-1989) in France, not via Rijperman as the placement of Bob De Moor’s name would make you believe, but via another partner. The project was however abandoned. Expect more details in the near future… On the bottom of the drawing Bob De Moor also placed the following remark for the publisher: “Tirer bleu + film trait sur Shoeller Merci!”. We’ll get back on this as Johan De Moor is right now rebooting his internal drive to dig up some more details… :).